Artificial sweeteners such as aspartame, sucralose, and acesulfame potassium fall under the category of designated additives according to Japan's Food Sanitation Act, and prescribed standards are in place for their use in some foods and quantities. Cyclamate and other artificial sweeteners used in some regions outside Japan are included among undesignated additives in Japan, and inspection is required in specific imported foods. Consequently, quantitation for large numbers of sweeteners are needed. An example of simultaneous analysis of 16 sweeteners using an LCMS-8050 is shown. MRM analysis was performed and results that met an accuracy of 100 % ±20 % and area repeatability (%RSD) of within 20 % were used for calibration point. Dialysis and solid-phase extraction are common methods used in sample pretreatment for sweetener analysis, but these operations have the drawback of being complex, time-consuming, and laborious. Pretreatment by solvent extraction requires no special equipment, and can be performed quickly and simply. 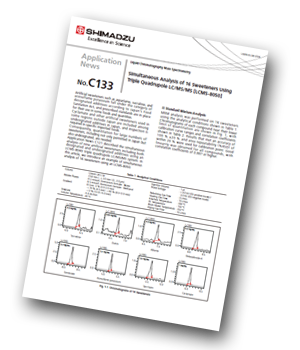 Triple quadrupole LC/MS/MS is shown to be an effective method for the simultaneous analysis of sweeteners. Good linearity was obtained for all compounds, with correlation coefficients of 0.997 or higher.